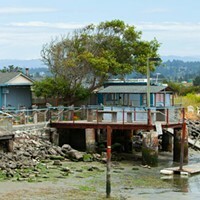 Oyster Beach on Humboldt Bay. Every day brings more daylight. 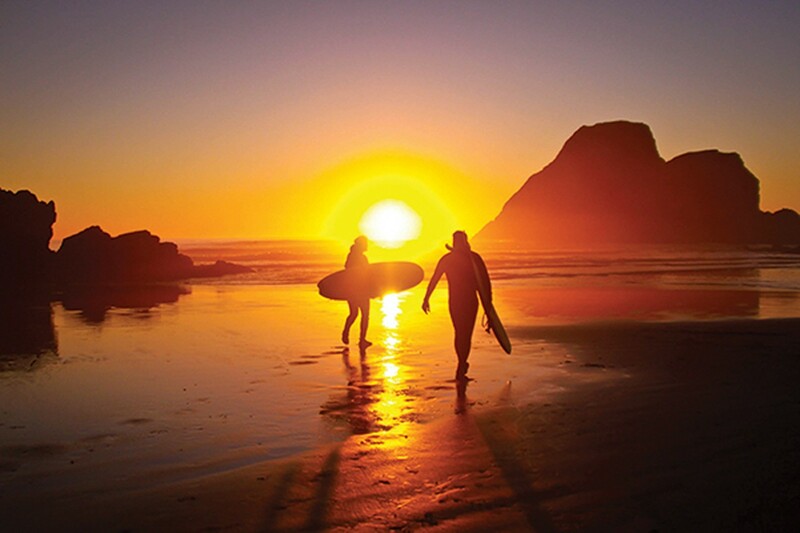 Make the most of it by exploring some of Humboldt's best places. Everyone loves Fern Canyon (Gold Bluffs Beach Road, Prairie Creek Redwoods State Park, Orick). So much so that you might think the place can't possibly live up to the hype. And yet, it does. 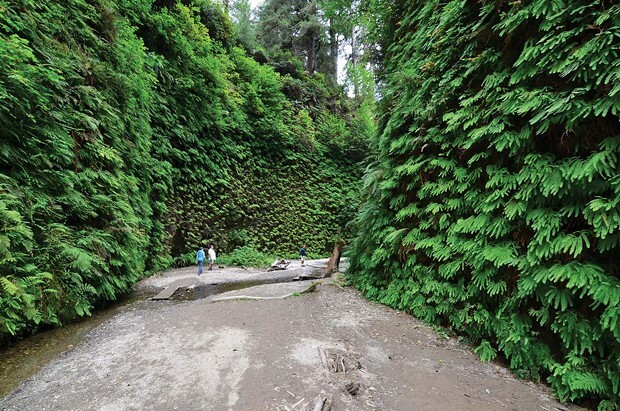 The walls rise along either side of the trail, dense with foliage, heavy with moss, thick with wonder — you'll expect dinosaurs to pop out and be slightly surprised when they don't. Given the location's fame as a setting for Steven Spielberg's Jurassic Park 2: The Lost World, this makes sense. Yes, you've entered directly into a verdant daydream. The easy, one-mile stroll takes you though a canyon that narrows to 30 feet wide as the walls rise 50 feet above. 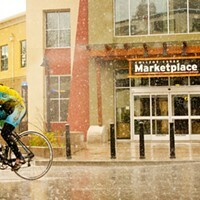 Take your time — and wear both clothes and shoes that can withstand the dampness. 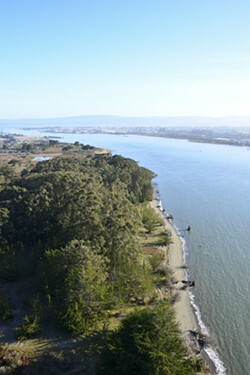 Part of Humboldt Lagoons State Park, Dry Lagoon (15336 U.S. Highway 101, Trinidad) acquired its name after being drained by farmers in the early 1900s. 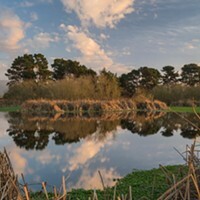 Unsurprisingly, crops failed to thrive along the shores, and today the marshland habitat supports a gorgeous mix of marsh plants and is part of the Pacific Flyway, meaning you might see bald eagles, peregrine falcons and threatened Western snowy plovers among the over 200 types of birds utilizing the area. As for additional recreation, you have many choices, all rewarding. You can stroll along the six miles of beach and watch for whales, dolphins and sea lions, collect rocks and generally let the scene steal your breath with its beauty. You can hike a three-mile trail that leads around the less-visited side of Stone Lagoon, mysterious and inviting. 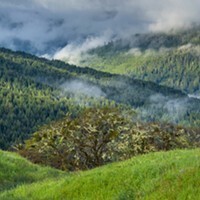 Think of Bull Creek Flats off of U.S Highway 101 in Humboldt Redwoods State Park as your starter trail. 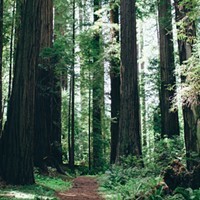 An introductory course to some of the world's tallest, most impressive redwoods. The scientific explanation is that year-round creeks impart a certain fruitfulness to adjacent floodplains, aka "alluvial flats." The less scientific reason for examining this locale is, "Wow." The 10-mile, day-long loop ambles through both Upper and Lower Bull Creek Flats, alongside and through redwood groves sure to impress. Civilization intrudes slightly, as the hike is a popular one and noise from the nearby road can sometimes be heard, but the experience remains well worth it. Pack layers, a picnic and plenty of water. People rave. And rave. And rave some more. Larrupin Café (1658 Patricks Point Drive, Trinidad) is considered one of Humboldt County's most delectable dining locations, with lovely ambiance, décor to die for, an impressive wine list and just the right amount of creativity. Locals revere the friendly staff as much as the excellent menu options. And when the locals like it ... Be sure to save room for dessert. Gill's by the Bay (77 Halibut Ave., Eureka) draws diners for the view and brunch mimosas on a clear day and to warm up with hot chowder on a rainy one. Brunch omelets, breaded razor clams and crab sandwiches on sourdough are solid choices, but check the specials just in case. Aptly named, Crush (1101 H St. #3, Arcata) infatuates guests with a full slate of wines, creative flights and a consistently tasty menu that includes a Brussels sprouts-blue cheese small plate not to be missed. Daily specials include divinely deviled eggs and artisan slaws. The joint's located inside the historic Pythian Castle, adding to the sense of royalty one experiences within. Crisp, appealing, colorful — and that's just the ambiance. The food rises to the occasion, whether a popular roll or an invention of the day, the chefs at Masaki's Kyoto Japanese Restaurant (320 F St., Eureka) raise the bar. Expect everything to be fantastic. 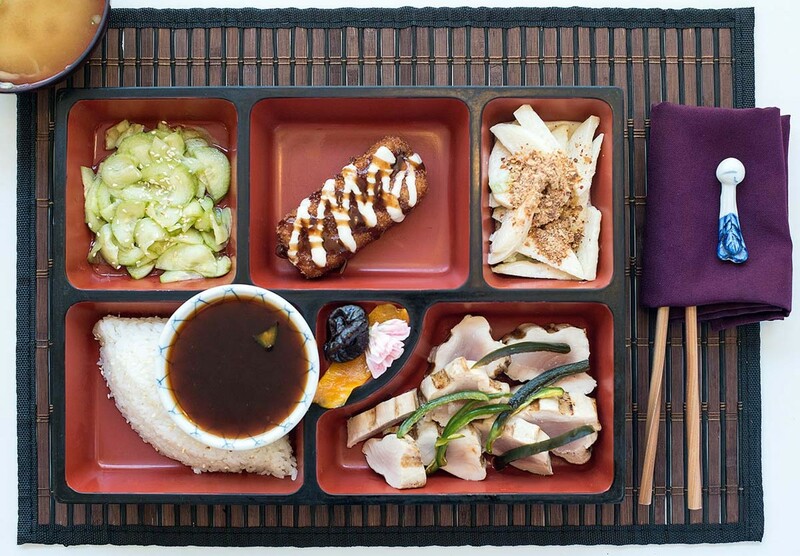 The midday "lunch box" option particularly pleases, what with the tray full of delectables, but you can't go wrong with dinner. Do make reservations. Up the street from the Irish pub, past the tattoo parlor, before the record shop, you'll find the Hall Gallery and C Street Studios (208 C St., Eureka, 498-0059). 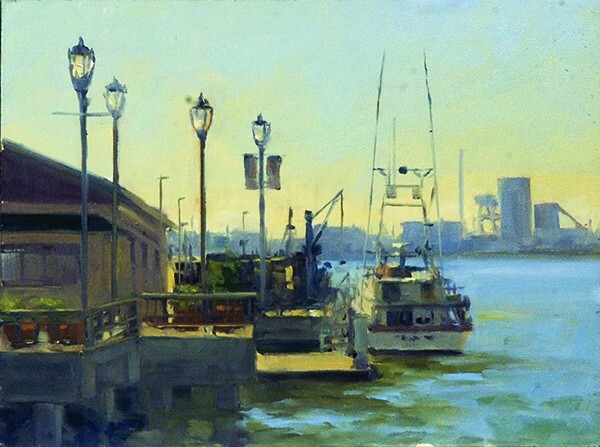 The artists' space is home to many of Eureka's finest, including John King, Regina Case, Rachel and Stock Schlueter, Elizabeth Berrien, Mimi La Plant, Kathy O'Leary, Anna Amezcua and Augustus Clark. The flavors vary, but the work is invariably delicious. The door is open during Arts Alive!, first Saturday of each month from 6 to 9 p.m., otherwise call for an appointment. A.) It's a surf shop. B.) It's an art gallery. C.) It's a tea house. D.) All of the above. D, of course — you're in Humboldt, where collaboration is second (and third and fourth) nature. That explains The Neighborhood Boardshop (1925 Alliance Road, Arcata), which exists, rather randomly, in an off-the-beaten-path Quonset hut, which contains within its pleasantly curved walls, a high-end tea stand, a photography gallery, a studio inhabited by Matt Beard of BeardArt, plus a surfboard shaping room for those folks who prefer their art to be rideable. Have some tea, check out some art, start shredding. Welcome to coolness, manifested. Persimmons Garden Gallery (1055 Redway Drive, Redway) provides a feast for the eyes, hands and mouth. Start by admiring the olive trees and water gardens in the nursery, then move on to the fine art gallery featuring local and global artisans. Continue exploring the seasonal textiles — silk, felt and wool are among the offerings. Finish by indulging in cheese, wine and dessert. What more does one need? Earth-friendly and all ages, the seasonal business opens mid-May. For 15 years, Piante Gallery (620 Second St., Eureka) has been a place counted on to offer excellent exhibits — but what those exhibits look like from month to month differs greatly. You might find traditional landscapes. You might find innovative modern photo collages. You might stop in during the annual Native American art show. This ability to celebrate a diversity of style while maintaining high standards is a large part of the gallery's success. Always worth stopping in. 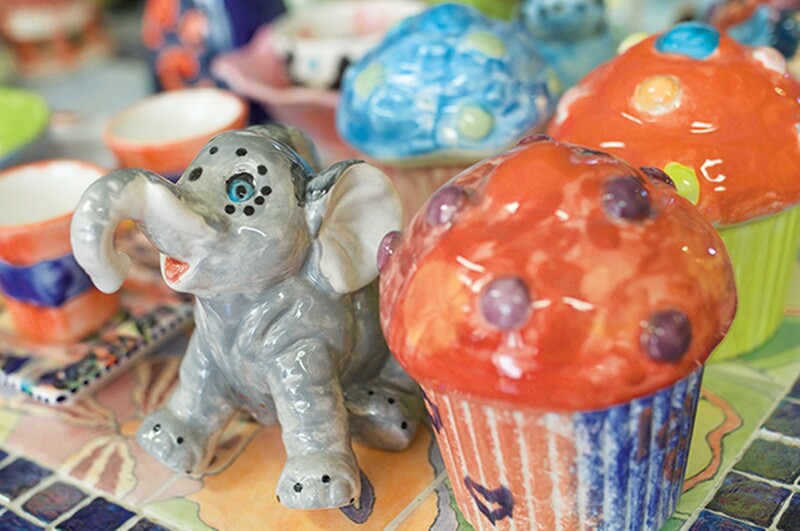 For the artistic child, Parasol Arts (211 G St., Eureka) offers a chance to paint the ceramic item of his or her choice, from cookie jars to treasure boxes. The price includes paints, kiln firing and all the studio time needed. The finished product is food-safe — perhaps a gift for grandma is in order? Don't worry: They ship. 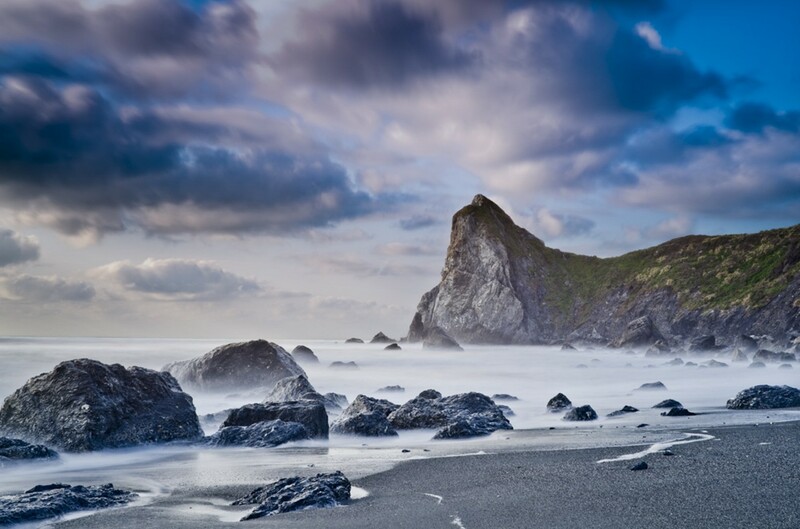 Humboldt State University's Natural History Museum (1242 G St., Arcata) enchants children and adults alike into exploring Earth's natural history, with special attention to the Humboldt part of our planet. Take a virtual tour of plant evolution in the redwood forest, marvel at the museum's fossil collection, note the buzzing bee box — Humboldt is home to the leaf-cutter bee, the wool carder bee and the silver bee — and study up on your North Coast seashells. Do you have one of those children for whom everything vertical exists solely as a path skyward? 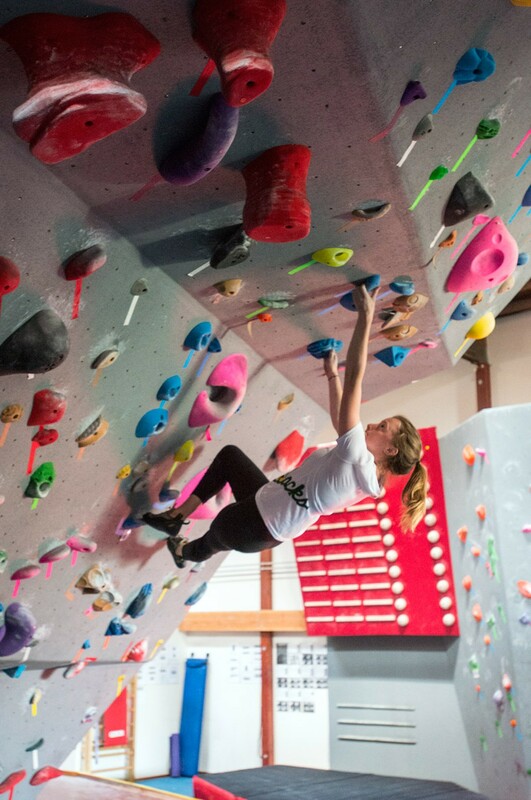 Put that instinct to good use at Far North Climbing Gym (1065 K St., Arcata), where cheerful, qualified instructors will teach your young ones how to scale a rock wall. Established in 2007, the gym has programs for youths of all ages. Call ahead for the week's options. 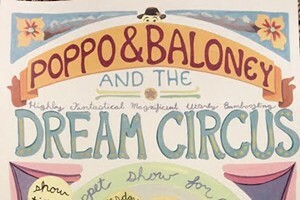 Take yourself back to days of innocence and, more importantly, drag your child along with you. What's the opposite of being stuck in the car for hours? Having wheels on your feet and hours to use them. 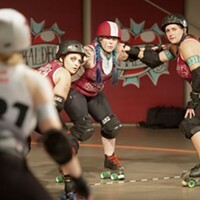 Thank goodness for Blue Lake Roller Rink (312 S. Railroad Ave., Blue Lake). Giggles optional, and likely. 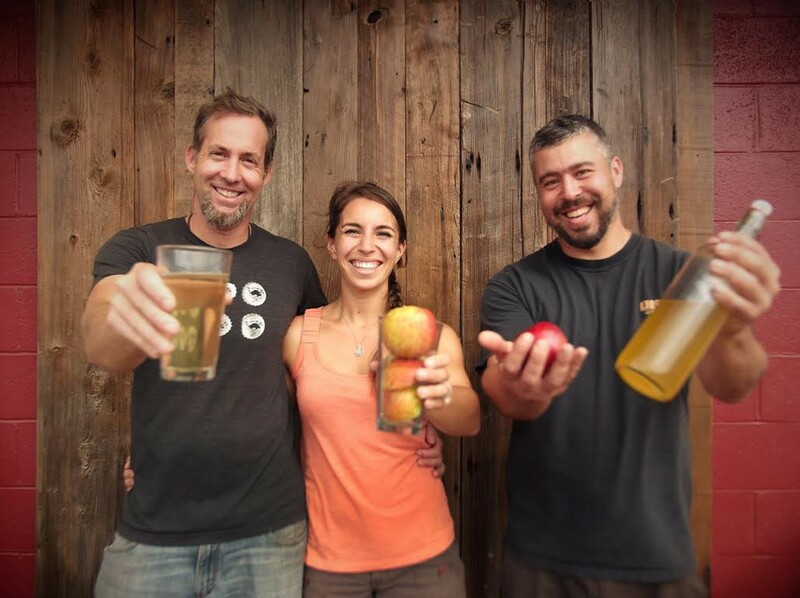 The Humboldt Cider Co. gang. The Arcata School of Massage (145 G St., Arcata) was founded on high intentions and a belief that the "stress-reducing benefits of therapeutic massage are a contribution to world health and world peace." The well-regarded community massage clinic does at least that much for the clients who visit by offering low-cost, quality massages. You'll leave physically relaxed and mentally renewed with the added benefit of having played a role in social positivity. During the recession, "staycations" became the norm, but here in Humboldt, residents have been taking advantage of being a destination for a long time. Whether you live here or are visiting, a world of stunning vacation rentals await. One of the most interesting is Oyster Beach, a historic and secluded property on the Samoa peninsula. Owners take the "historic" part seriously — local historian Ray Hillman consulted on the design and construction process. Only 10 minutes from Arcata and Eureka, but the surrounding cypress and eucalyptus groves and expansive view of Humboldt Bay will have you feeling delightfully far away. Staying adjacent to California's smallest weekly paper offers big benefits. 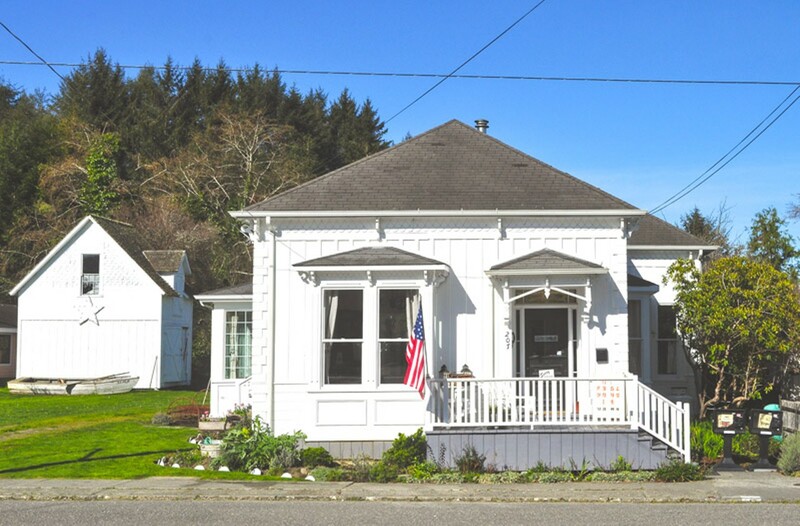 The Quarters, a seven-room bed-and-breakfast, is in the same 1888 Victorian as the Ferndale Enterprise, which means guests can avail themselves of the "inside scoop" from the folks who know everything happening in town. Restaurants, pubs and the pretty Ferndale cemetery lie within walking distance. In-house amenities include a clawfoot tub and other vintage furnishings, plus a large porch perfect for people- or parade-watching. Find The Quarters and Oyster Beach on www.airbnb.com. It's unlikely you'd just happen to come across Humboldt Cider Company's new tasting room (3750 Harris St., Eureka) by accident — the rustic-modern, indoor-outdoor space stands on a corner of Redwood Acres Fairgrounds, tucked behind a residential neighborhood. Seek it out. The apples are hand picked at family farms from Mendocino County into Humboldt, and the ciders are correspondingly fresh and refreshing. Editor's Note: Arcata School of Massage has reopened as Arcata Massage Collective (1139 Buttermilk Lane, Arcata). Crush is now Madam M's Crush Wine Bar and Bistro.